When I interviewed Jonathan Horne (John Proctor) last October he shared, "I'm getting the chance to live out one of my longest running theatrical dreams by playing John Proctor in 'The Crucible' at Actor's Express." Johnathan is magnificently fulfilling that dream in The Crucible at Actor's Express through Sunday, February 19. A Suzi Bass nominee, Jonathan is making a remarkable and most memorable Actor's Express debut. Do...not...miss...this...play! 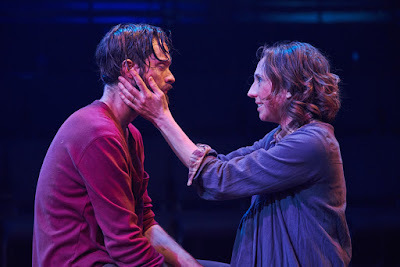 I've had the honor of seeing Shelli Delgado (Abigail Williams) in at least three other plays over the last two years. She's incredibly talented and plays a expansive range of roles. You know those actors that you 'hate' because they performed the role of a villain so well? They convinced you wholly that they're that horrible person they're portraying? 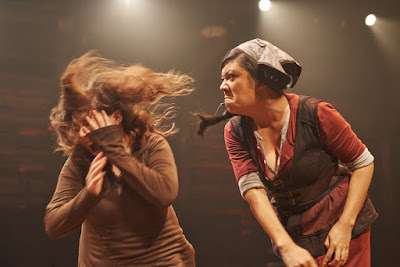 That's Shelli in this play...you can't help but 'hate' her in this play! Shelli portrays Abigail Williams, the 11 year old (she was portrayed as 17 in the 1957 film) that history tells us was one of the two ring leaders that when rumors of witchcraft started circulating in their town they started to accuse people—that they didn't like or found an impediment to their own desires—of being witches to divert suspicion from themselves. In 1692-1693, nearly 20 accused were killed and several more died in prison. Fortunately, I've also seen Shelli play Little Red Riding Hood and know her to be funny and wholly delightful. She's a true gem in the ranks of Atlanta actresses. I think you'll love 'hating' her in The Crucible, too! I knew Arthur Miller was a playwright, but have—embarrassingly—never seen any of his works (especially surprising as much theatre I've seen throughout my life). It was during my budding fandom of Marilyn Monroe—they were once married—that I learned of his career. I can say with great enthusiasm that after seeing this production of The Crucible I will seek out other Arthur Miller works. "The witching hour is at hand in the tight-knit community of Salem. Personal vendettas collide with lust and superstition, fueling widespread hysteria. Do witches walk among us, or has revenge created a monster? As paranoia grips the tiny town, reason takes a back seat to fear—and all hell breaks loose in this visceral new production of Arthur Miller's riveting masterpiece." I love that so many Atlanta actors are supportive of each other...they're like a huge extended family. You don't see that in every profession. Before the play began, I had the opportunity to briefly chat with Diany Rodriguez who I've also seen in a number of plays, including one with Shelli Delgado. Diany was there as a theatre-goer like myself. She's absolutely delightful. I also me actress Yolanda Asher. I wasn't eavesdropping, but heard her talking about another play that I wasn't wholly sure I wanted to see, but after hearing her description of it, I got tickets and went the next night. I'm filled with gratitude for the opportunity to get to meet so many of Atlanta's actors and love that they're consistently wonderful people! The cast in this play is large, and filled with great talent. 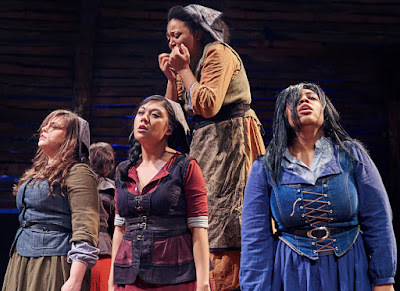 A few of my other favorite performances were by Courtney Patterson (Elizabeth Proctor), Greta M. Glenn (Rebecca Nurse), and Tamil Periasamy (Rev. Hale). Each of them bring great intensity to their respective characters. Courtney, as John Proctor's wife, was a perfect balance to Jonathan's powerful portrayal of the conflicted farmer. Her inner battle between broken heart and loving wife was as mesmerizing as it was convincing. "Because it is my name! Because I cannot have another in my life...I have given you my soul, leave me my name!!!" Jonathan Horne convinces you through your breaking heart that he's feeling John Proctor's pain, that losing his battle the with wanting to live is giving way to being a man of integrity, a man of goodness...his releasing of a lie that would end his life was worth his eternal soul. 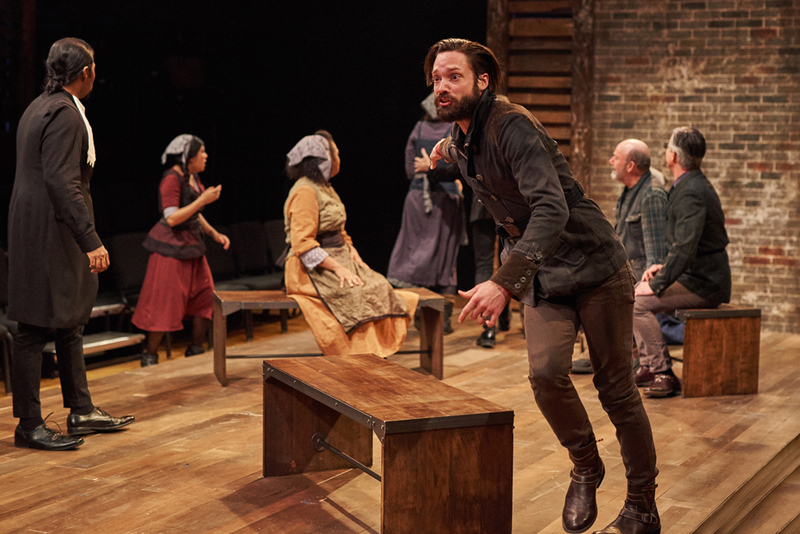 The Crucible won a Tony Award for Best Play in 1953 and was nominated for Best Revival of a Play in 2016 (that Tony went to another Arthur Miller play). 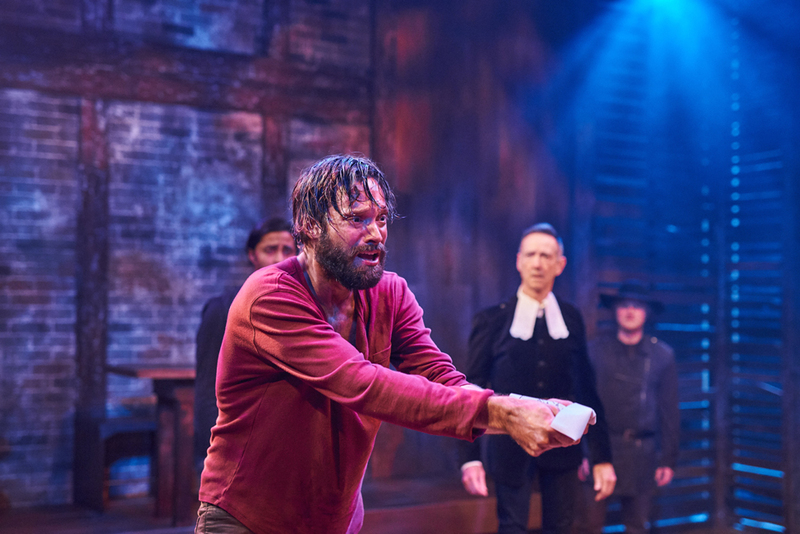 In my humble opinion, Jonathan Horne gives a Tony Award-worthy performance in this run of The Crucible at Actor's Express. This is the final week to see the play. Use everything at your disposal to get tickets to see this show...it will definitely be recognized as one of the best in Atlanta for the season.